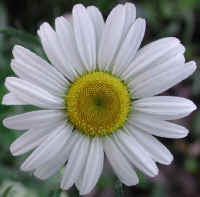 (Daisy (Chrysanthemum leucanthemum) - 01) The daisy, a native of Europe, was brought to the United States and has spread across the country. There is only one variety. The narrow toothed leaves can be seen in the left half of the photo. 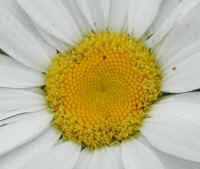 A single daisy flower grows on top of a single stem. 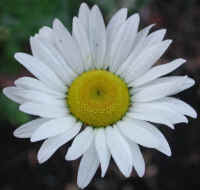 (Daisy (Chrysanthemum leucanthemum) - 02) According to the literature, the Daisy has between 20 and 30 white petals radiating out from its central yellow disk; however, we counted 34 petals on this flower. 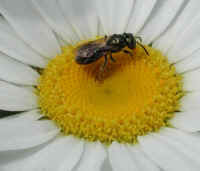 In the mature flower the central yellow disk is more funnel shaped than flat, as the term disk implies. (Daisy (Chrysanthemum leucanthemum) - 03) The central yellow disk of the daisy has an almost hypnotic appearance as if it were in motion. 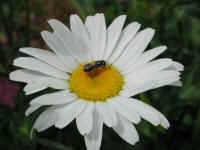 The daisy has an acrid tasting juice which grazing animals avoid. The crushed leaves were used for healing bruises which led to the name, bruisewort. The juice was also thought to prevent gout. Perhaps the reason was that the acrid taste led to a loss of appetite, and in turn to eating less animal flesh which would reduce the major cause of gout. It was also thought to stunt the growth of dogs, perhaps for the same reason (loss of appetite). (Daisy (Chrysanthemum leucanthemum) - 04) This enlarged photo of the central yellow disk shows the detail of the outward radiating structure as if the slightly descending funnel shape were spinning and the yellow was being flung out. This is just another example of the "sophistication" and wonder of God's creation that should cause us to want to protect our environment. (Daisy (Chrysanthemum leucanthemum) - 05) This little wasp has come to dine on the nectar of the daisy's newly opening disk flowers. (Daisy (Chrysanthemum leucanthemum) - 05a) This is a wasp's eye view of the daisy's lunch guest. 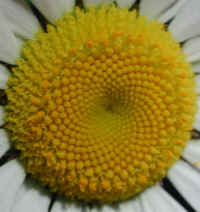 In this photo, we can also see that the outer disk flowers open before the inner ones. 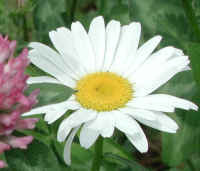 (Daisy (Chrysanthemum leucanthemum) - 06) This is another one of nature's little bouquets. 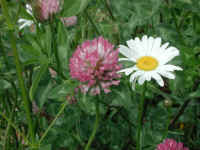 Here the daisies are growing with red clover. 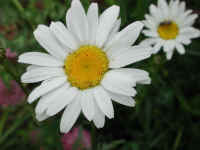 (Daisy (Chrysanthemum leucanthemum) - 06a) In this photo, we can see that some of the daisy's white ray flowers have been damaged. (Daisy (Chrysanthemum leucanthemum) - 07) This is another look at the daisies with our friend wasp on the daisy in the background. (Daisy (Chrysanthemum leucanthemum) - 07a) We are always fascinated by the wonders of God's creation, such as the swirled pattern of the daisy's disk flower buds.